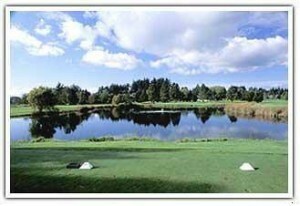 Whidbey Island Golf Courses + Reviews, Tee Times, more..
A great course set in the midst of a quiet, lake and tree lined glen of Oak Harbor WA, you’ll find the natural beauty and unique character of one of Whidbey Islands best kept secrets. Welcome, to Whidbey Golf Club, established over 52 years ago in 1961, Whidbey Golf Club is a semi private, family oriented club that boasts of one of the northwest’s most exciting golf courses that accommodates all levels of play from champion to super senior. This course is one of the better Whidbey island golf courses, with natural beauty, interesting layout, and a great dining experience make WGC a great choice for any occasion. .
Oak Harbor sits in the “rain shadow” of the Olympic Mountains resulting in an average annual rainfall of 19” which is at least 50% less rainfall than most of the Puget Sound area. The lower rainfall, combined with the soil conditions makes the golf course playable in the middle of winter. Owned and operated by NAS Whidbey, this course caters primarily to military personnel, but is open to the public. An 18-hole, award winning course with spectacular views of the Olympic Mountains. The course overlooks the Strait of Juan de Fuca and Vancouver Island. this is one of the more scenic Whidbey island golf courses. 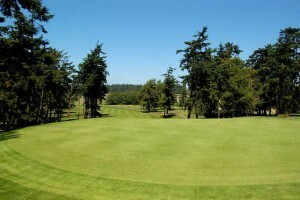 Useless Bay Golf & Country Club is a private golf and country club that features one of the Northwest’s finest 18-hole golf courses. 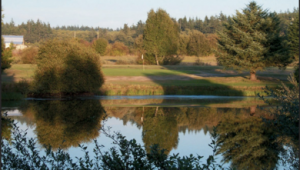 An all-weather, year-round golfing facility on Whidbey Island, the course utilizes the foliage, topography, and natural water hazards of Whidbey Island. With par from the men’s tees a 72 and par for women 74, golfers of all abilities will be challenged and charmed by the experience offer by this beautiful Whidbey island golf course. Useless Bay Golf Course offers a full service golf pro shop, driving range, practice putting green, golf carts and cart storage, knowledgeable professionals, golf lessons, men’s and women’s associations, tournaments and events. Some tournaments during the Spring and Summer months are open to the public. Not open to the public, ask a member to take you golfing. 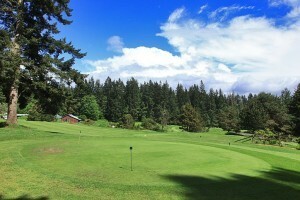 This is one of several public Whidbey Island Golf Courses. Holmes Harbor Golf and Beach Club is a par 64 golf course, with many elevation changes and interesting hole designs. 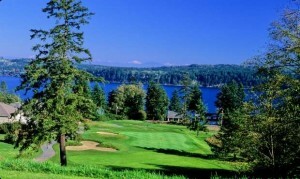 This is a golf course that treats the player to a variety of unique challenges as well as amazing panoramic views of Holmes Harbor and the cascade mountains. Located in the beautiful and serene forests of South Whidbey Island, Island Greens is a 9 hole, par 3 course that has been rated as one of the Best Courses of it’s type in the Northwest. The highlight of playing here is the beautiful flora throughout the course, including many Pacific Rhododendron. This is one of the smallest Whidbey Island Golf Courses, but it’s very beautiful. If you are looking to work on your Long Game, they also offer the only Public Driving Range of South Whidbey Island golf courses. Lam’s Golf Links, a local Oak Harbor golf course, has forever been an icon to native Oak Harbor residents since it opened in 1972. Lam’s is a family owned par three, nine-hole golf course conveniently located near Deception Pass State Park, the gateway between Whidbey and Fidalgo Islands. Lam’s also boasts an 18-hole mini-golf course, perfect for entertaining children and adults alike. Lam’s is excellent for beginners and those seeking to improve their short-game.